This post will be talking about plot points that have been revealed on HBO’s Game of Thrones, the excellent televised adaptation of George RR Martin’s A Song of Ice and Fire book series. So, this will be spoilery to some degree, so unless you’re up to date on the show or just love being spoiled, consider this your warning. One horn blast for Rangers returning. Two for Wildlings. Three for the Others. Four blasts for Spoilers! Talking about spoilers is particularly relevant at this time, since recently the Game of Thrones showrunners Benioff and Weiss have announced that the next 3 seasons of the show (with the seventh season anticipated to be the last one) will be revealing things that have not yet been published. And there will be differences. With Season Five premiering in under 2 weeks, the Sullied book readers are on the cusp of experiencing the show more and more like an Unsullied show watcher who didn’t realize that Bran was about to be pushed out a window, or that Ned Stark’s role in the show was to stick his neck out bravely. Boom. I used to think I was a big fan of A Song of Ice and Fire. I mean, I’m still a fan, but in the aftermath of the seventh episode of Game of Thrones season four (“Mockingbird”) I discovered that my Game of Thrones Fan Card was invalid. In that episode, Littlefinger does something that my fellow book readers and I had been waiting for for some time. He pushes Lysa Arryn out the Moon Door. Yes! And to think that they were still on their honeyMOON. Before I continue, let me state up front that I don’t like Littlefinger, I don’t support this type (or any type really) of domestic abuse, and defenestration is a pretty cruel way to eliminate your enemies. But let’s be honest… seeing Lysa Arryn made to fly was pretty great. You just know that she’d unjustly done the same to anyone who irked her enough. I found it quite satisfying. But there were some who did not. Some who were quite outraged. Because of something Littlefinger said. The books and the show play out rather similarly. The biggest difference is that there isn’t Lysa’s musician Marillion hanging around who Littlefinger will use as the “fall guy” for Lysa’s death. That’s fine. Lysa is about to push Sansa out into space when Baelish shows up and calms her down. Lysa is clearly jealous of Sansa and thinks Baelish is in love with her. In a comforting manner, Littlefinger explains that there’s only one woman he’s ever loved. The show had a subtle difference. I’ve read the books, but apparently my retention of the details is insufficient, because I hadn’t noticed the difference. That is, until in the days after the episode aired when I read reviews and listened to podcasts hosted by knowledgeable book readers who were outraged by the change in the line. You would think Littlefinger pushed Sansa out of the Moon Door. I know that occasionally dialogue gets changed and the fans deconstruct and critique the changes (like Sam calling himself a “coward” instead of a “craven”, or Roose Bolton saying “the Lannisters send their regards” instead of “Jaime Lannister sends his regards”) but the ire in this instance seemed over-the-top. It’s two words. I couldn’t understand why it was that big a deal. But I felt that way because I wasn’t as informed as I thought. Or I might say, as inFORUMed as others. Quick question? What’s the name for the wedding where Edmure Tully gets married to Roslin Frey? Yes, I mean the one where Robb and Catelyn get killed, yes yes. Why is it called that? Well, that’s what it’s named on the show, and in the books. What’s the name for the wedding where Joffrey marries Margaery, which includes the Best Event Ever at a Wedding Reception? That Event, Would that be Dwarf-Humiliation? Why is it called that? Well, sure, Joffrey turns purple while choking to death, but is it called that on the show? In the books? No. 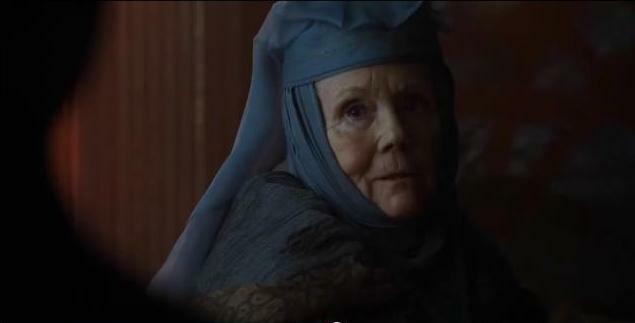 There isn’t any scene in the books with a Westerosi social engagement planner starting a trend for weddings, insisting that they have catchy color-based monickers. The first I heard about the Purple Wedding was on the run up to Season Four, but it apparently had been a well-established term among book readers who were having discussions on the various A Song of Ice and Fire forums. I was just out of the loop. I mean, as soon as I heard the term, I knew exactly what it was referring to. I’ve since read about other code-name references to future book-events, and I recognize what they refer to, but these are conversations that had been going on for years without my knowing about it. It was in the online discussion landscape where the phrase “Only Cat” achieved a kind of iconic significance. Like a secret handshake, book readers could talk about the upcoming season without alerting their Unsullied friends. 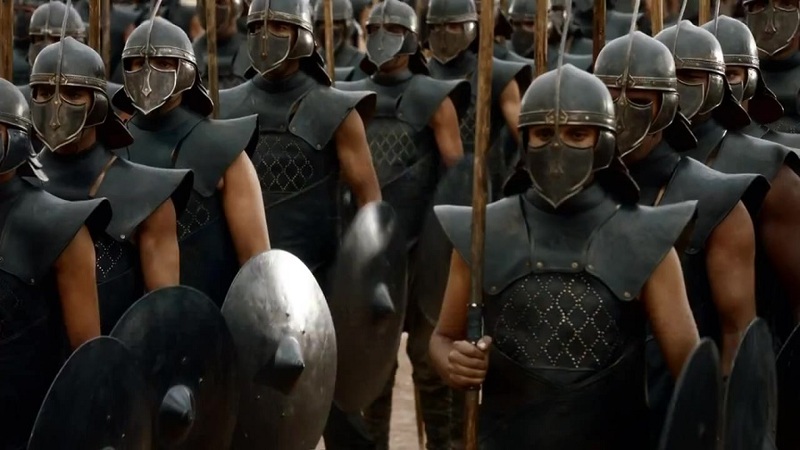 Unsullied Show Watcher: Woohoo, can’t wait for next week’s Game of Thrones. Sullied Book-Reader: Oh, me too! Can’t wait. Yeah. When Baelish said “Your sister,” instead of “Only Cat,” it wasn’t just that a line was changed, or that some book-reader’s expectations were foiled; in my opinion the outrage that sprung up was based on a feeling that the show-runners had deliberately changed the line to tweak the collective noses of the fans of the books. Since “Only Cat” was such a Masonic Temple style passphrase, changing it for the show was some kind of insult. Because the show-runners must have known about this lexicon. Look, I’m not trying to deliberately piss off a segment of the book reading fanbase (or maybe I am) but they can’t take that line change personally. It seems just too paranoid to imagine the writers wanting to do this for that effect. I’ve read a reasonable alternative for why the line change might have been done for thematic purposes (as opposed to some concern that people might have forgotten who “Cat” was) but I just don’t think the line is important enough to fret about. There was only one really important thing that happened in that scene, for my money. Honey, while you’re down there, would you look for my keys? I can’t find them anywhere, and for all I know, Lord Robin might of… oh, this is useless, she’s clearly out of earshot. My point is, with the upcoming season expected to deviate from the books, and expected to be revealing plot elements that GRRM has given to the showrunners in their “look, in case I die, here’s what happens” briefings, book readers will have more and more opportunities to either accept the situations presented on the show, or to get angry. And I Find This Fascinating! I can’t help talking about it. I kind of think some literary anthropological study could be done! Last season, we saw something that had never happened in the books. 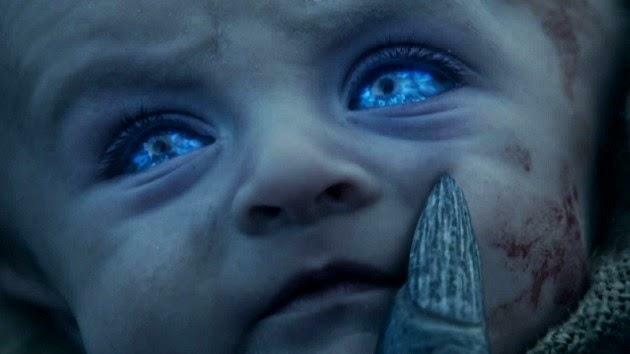 An Other (that’s a White Walker to you show-only people) took one of Craster’s sons to a secluded spot in the north, and a horned Other (credited in various places as the “Night’s King”) transformed the child from being a warm-blooded human baby into a blue-eyed Other. Time for HBO to remake DUNE. This was a situation that had been heavily theorized; many (if not all) book-readers assumed that the newborn boys were being converted into the White Walker population. I think I remember Craster’s wives referring to the Others as “Craster’s Sons” (and I really need to do due diligence and either confirm that or stop insisting that it’s true) so seeing this happen on the show was not a surprise. But there’s a book reading population that just doesn’t want anything not explicitly shown in the books revealed on the show. Even though this happens all the time. 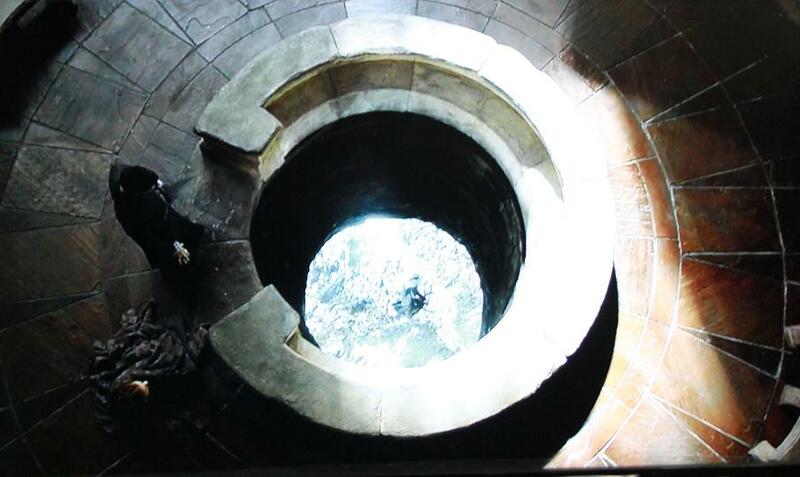 Season One: we see Varys and Magister Illyrio conspiring in the dungeons. In the books, Arya sees two people that she can’t recognize. We assume it’s Varys and Illyrio… the show confirms it. Season One: we literally see Jorah getting a pardon for tattling on Dany’s pregnancy, and it’s tied in with the imminent poisoning threat to Dany. This is not clear originally in the books (but we all pretty much assumed it, right?) although it more or less gets confirmed implicitly when Selmy rats out Jorah at Meereen. No one was seriously spoiled watching the show and having these events laid out. Season One: Loras and Renly. Trust me, there was a large segment of the book reading population that completely missed that when reading the books. Season Three: We KNOW that Theon’s missing his kraken. ’nuff said. 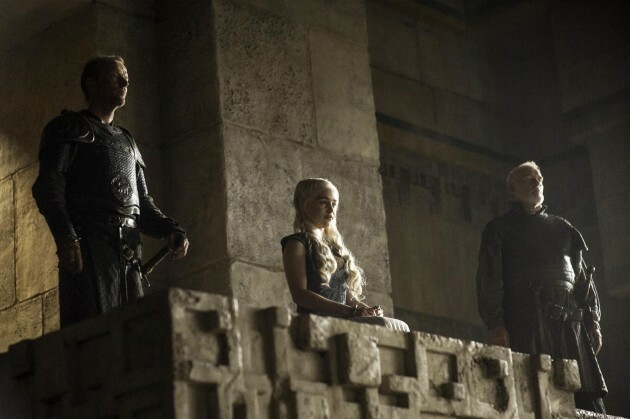 Season Four: So, who was involved in the plot to poison Joffrey? Things are way more clear on the show than they were in the books. Don’t be ridiculous! 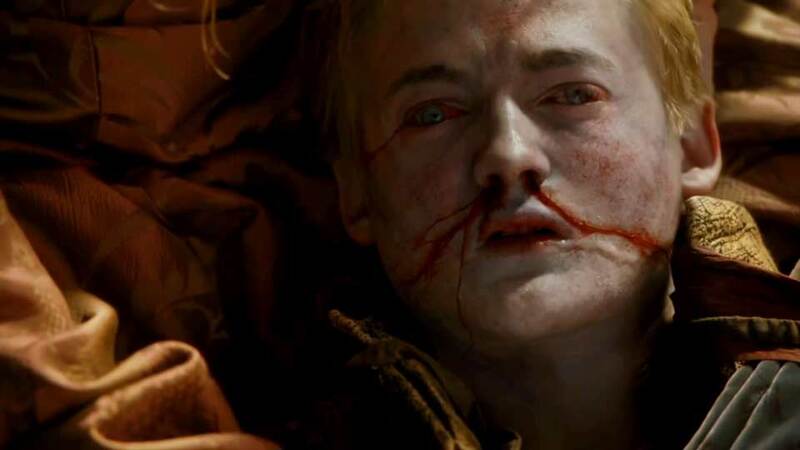 Joffrey clearly died of natural causes. I’ll hear no more nonsense! The show is just going to tend to reveal things earlier than in the books, it’s the nature of things. Coming back to Barristan Selmy’s example of revealing himself early, it’s fundamentally the same as the viewers seeing the Night’s King converting a child, if a show-watching someone hadn’t read all the way up to the reveal of Selmy’s identity near the end of A Storm of Swords. If they didn’t want to have the fact spoiled for them in their book-reading experience, they really need to not watch the show until they’ve read up. If one is insistent that the show not spoil the uncompleted books that they want to read in an unspoiled fashion, it’s no different. They might want to drop out of the show now. I know that’s sucky advice, particularly because the Internet won’t save their innocent state. It’s just the way it is. We’re going to be getting more of that. Brace yourselves. Watching people watching the show has become it’s own spin off of Game of Thrones. The situation of the show diverging from the books creates an entire new class of Unsullied people: those who are watching the show, but are planning on reading the books in the future. Anyway, because of this situation, I think it’s reasonable for the book readers to consider and examine how we talk about the show with our show watching colleagues. We love talking about the show. We love talking about the books. We love talking about the differences between the books and the show. Maybe we should take a break from talking about the differences, so much. Like I said, there’s a group of people watching the show who are probably willing to read the books eventually, just not while it’s airing. I think it’s great to encourage them to do so, and I think they’d be more willing if the story in the books is not so well known to them beforehand. Since the show is deviating, if they don’t know what the differences are, the books remain somewhat unknown. I think it’ll be interesting to have the differential discussions after they’ve read the books and discovered them for themselves. And, on a more practical level… sometimes people who have read the books don’t understand that the show might be presenting things differently than they expect, and reveal future plot points inadvertently. They were half right. In the books, in the same audience where Dany was being presented with dead goats and agreeing to compensate the shepherds, the last guy had a dead child. On the show, the show runners decided to separate those scenes, so that reveal happened in the final episode. Thanks for spoiling that reveal with all of the baby-eating dragon talk, yo. I love Nathan Fillion, but while he was a guest on a Game of Thrones podcast, after the battle at the Wall was aired, he went into great length about how a particular scene from the books was not included and why it was so important. He was misremembering the timeline of events. The stuff he was describing is probably going to be happening this season. Hopefully, no one listening to him and wanting to be unspoiled will remember the details of what he was saying. I think book-readers should at least be mindful when talking differences between the books and the show. What they perceive as omissions might still be cards in the hand, waiting to be played. Okay, I’m not the boss of you. There’s no need to follow my advice. It’s all good. Experiencing Game of Thrones, as the televised quasi-adaptation or as the written A Song of Ice and Fire (which some might one day consider the novelization of the TV show) is a wonderful thing, as is the experiences of interacting with the fan base who have various levels of insight: from the show-watchers who have not read the books, to book readers like me who are enjoying the show, to the Illuminati-level fans who know all the secret passwords and REALLY know the show (and the theories and the counter-theories) inside and out. I have no idea what future television show will so engage the fan base in the future. When LOST went off the air, I thought I would never see its like again. Book readers are sensitive to changes and stuff. (You know that.) My respectful suggestion is that everyone just ease up and take the show on its own terms. And just avoid talking about specifics. The Buddha said (I think he said the following, I’m basing this from Roger Zelazny’s excellent novel Lord of Light) that all suffering springs from desire. I think book reader suffering springs from expectations, and lowered expectations might lead to less personal suffering. I make no claims to the artwork, but some claims to the text. So there. I read the books years ago, so while I vaguely remember the plotline(s), there are lots of details in GOT that I’m surprised by in a “oh, yeah” kind of way when I’m watching the show. I enjoyed the books, and I’m enjoying the show, and I’m not interested in nitpicking the way I did when LOTR came out and I sat in the audience silently noting all the changes. Frankly, they excised a lot of tedious and irrelevant stuff from LOTR, and Tolkein’s long dead, whereas I assume GRRM is watching over the producers’ shoulders so whatever they’re doing, they’re doing with his blessing or tacit approval, anyway. OR, and I hope this is the case, he’s working so hard on the next book in the series that he’s not noticing what they’re doing. At any rate, so far so good. Keep up the awesome picture captioning, Pat! I needed a laugh today, so thank you. Thank you so much! I was worried that this think-piece (if I can presume to call it such) wouldn’t be that entertaining a read. I’m glad the captions helped, that’s my Wildfire Secret Weapon! Thank you again for the comments, and I’m glad I could provide you a laugh. It’s one of the reasons I do these blogs, to make people laugh. Hope you and your family are all doing well, and thankfully we only have 12 more days (more or less) until Season 5 starts up. I’ll be completely honest. I kinda skim read a lot of the post. I agree with your views on taking the show and the books as separate as probably the best way to go. LOL! It’s all good. That’s why I had a Too Long Didn’t Read section. No worries. 🙂 Your comment was Too Long; Didn’t Read. Thank you so much for the feedback. I totally agree that the show is an outstanding masterpiece. Your friend is a great friend for getting you to watch the show. Oh wow, I didn’t even know about the “Only Cat” codeword thing. I would like stuff like that more if I knew people weren’t using it to snub others. Ah well. I am looking forward to being surprised again, honestly. When I watched the first season I hadn’t read the books; then I blew through all 5 in time for season 2. Some of the most fun this season has been from unexpected things, so it’ll be nice to be “at sea” again storywise! I know there’s a new chapter out, but I haven’t read it! I wonder if GRRM is trying to release stuff from the books so that it won’t technically be ‘spoiled’ by the show. As always, thank you for your comments! Oh, and I didn’t really mean to imply that the super forum fans with their code phrases are snubbing anyone, they’re not being exclusionary (that I know of) it’s just the secret language that they communicate in. In fact, they think everyone is on the same page as them, in same ways. Playing catch-up on my reader! This was a great post. I think about this stuff… way too much. As you know, I read the first book after watching seasons 1-3, and the other four books in a GoT-starved freakout following season 4. When I read “Only Cat”, I appreciated the power of the line, and assumed that it had been the same on TV. I wouldn’t have even known there was a difference without the internet outrage! I have fears about these “deviations” although I know I should really calm down. I think my main worry is that the Benioff & Weiss will somehow “mess up” the story. Not spoil it for me, but actually mess it up. Being spoiled isn’t the worst thing that can happen to you. I knew about the Red Wedding before I started watching the series (damn Facebook), and I still loved it! 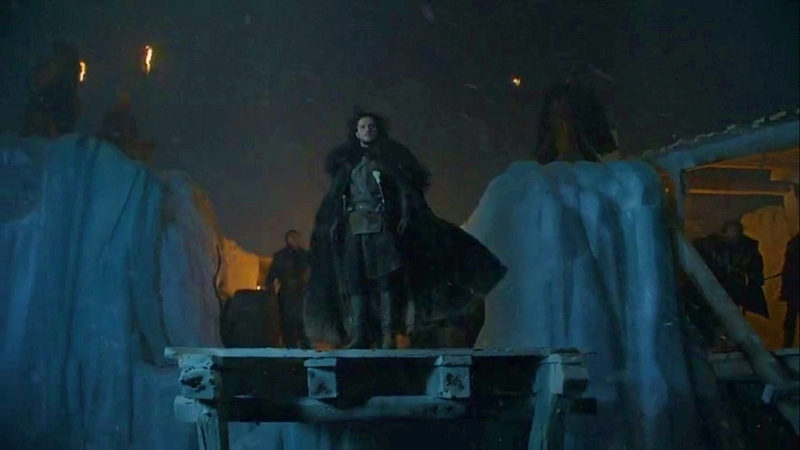 The show doesn’t have flashbacks (though I guess we’re getting some this season) and I think that is a bit of a problem as far as Westerosi history is concerned. I retained almost nothing about the Robert’s Rebellion Era via watching (sometimes I think I just get dazzled by visuals and I realize I haven’t heard an entire monologue), but learning all of the backstory was one of the highlights of my reading experience. If there’s going to be some kind of *payoff* regarding secret parentage or whatever other theories are floating about, I think show watchers could be at a disadvantage. Funny story: the best thing in the world happened to me, which is that my best friend decided to start watching GoT, and she’s going to let me watch her watch it! (Well, we’re going to watch it together, but I can already see myself creepily staring at her for her reactions.) She texted me over the weekend that she was watching her first episode and I was thrilled…. only to get a text an hour later, saying “I think I watched the tenth episode instead of the first one by mistake. Dragon Lady’s boyfriend dies, huh?” I cried a little. That’s a great story, that you have a friend who will be a bug under the Haley microscope… I mean, a buddy to watch the show with! I’m on board with you about messing things up, rather than spoiling things. Fingers crossed that whatever we see on the show will be entertaining, and we’ll still find the novels compelling. As always, thanks for the feedback, I’m glad you liked the article. Enjoy your re-watch with your friend, and your watching of Season 5! Late to the party, but I enjoyed your post. That “Only Cat” complaint is perhaps the single most ridiculous uproar I’ve ever heard from the fandom. I read the books, but it was after the show came out. I had heard the books were good, and when the show got good reviews I knew I would want to watch, but I wanted to read the original material first. So I’m a book reader, but I don’t have the same emotional connection to the books as people who were fans of it years before the show. For that reason, maybe, I notice the adaption changes, but it rarely bugs me. If anything, I appreciate the changes, and it enhances the experience. I think I am very weird in that sense though. Late to the party? The party was waiting for you, so it could start! Thanks for your comment, I’m glad you enjoyed my post. And thanks for talking about your show watching/book reader background. I enjoy hearing how people have come across the story. Looking forward to talking more with you, friend.